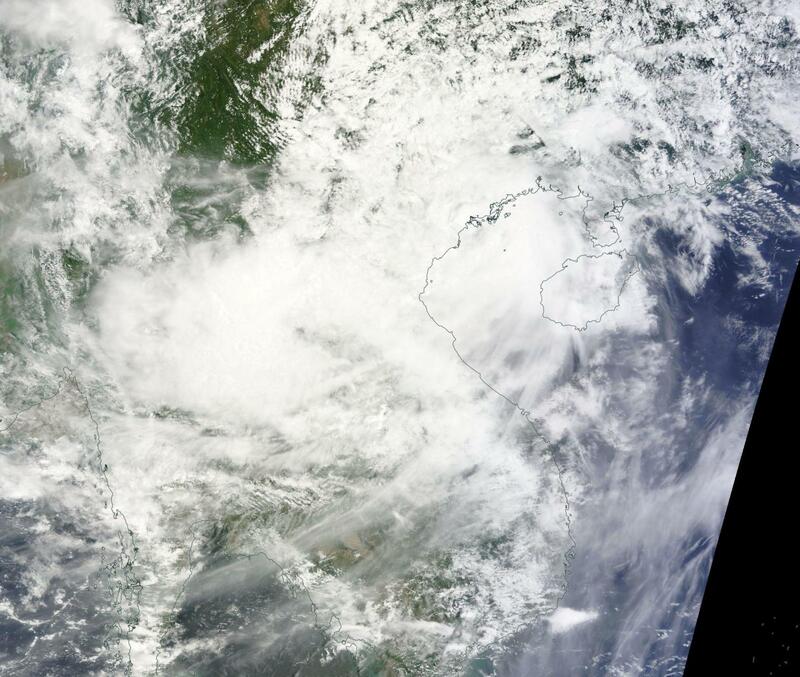 NASA's Terra satellite saw Tropical Storm Dianmu after making landfall in northeastern Vietnam. On Aug. 19 at 3 a.m. EDT (07:00 UTC), the Moderate Resolution Imaging Spectroradiometer or MODIS instrument that flies aboard NASA's Terra satellite provided a visible light image Dianmu. The image showed Dianmu's center in northern Vietnam with associated clouds and showers extending into southern China, Laos and Thailand. At 5 a.m. EDT (0900 UTC) on Aug. 19, the Joint Typhoon Warning Center issued their final warning on Dianmu. At that time the center of Tropical Storm Dianmu was located near 20.8 degrees north latitude and 106.5 degrees east longitude. That's about 36 nautical miles east-southeast of Hanoi, Vietnam. Maximum sustained winds were near 46 mph (40 knots/74 kph). Fiona was moving toward the west-northwest near 13.8 mph (12 kph/22.2 kph). The storm is expected continue moving in a west-northwestern direction and dissipate. For updated warnings from the Vietnam Hydrometeorological Service, visit: http://www.nchmf.gov.vn/web/en-US/43/Default.aspx#.